SEOUL, South Korea, Feb. 13, 2019 /Christian Newswire/ -- Church sanctuaries decked with national flags and leader's photos. The Ten Commandments edited. Bibles retranslated as state church leaders emphasize the need to free Christianity from its "foreign cultural captivity." These are the reports emerging from China today. According to many Chinese religion analysts, they represent not a return to the Cultural Revolution but to something even earlier. 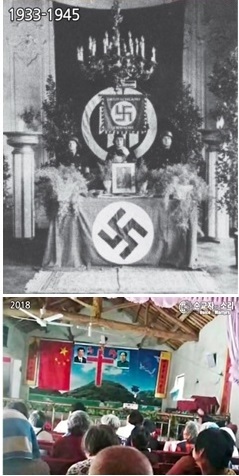 "Put the photos of 1930s German church sanctuaries and 2019 Chinese church sanctuaries side by side. Put the speeches of the leaders and officials side by side. The similarities are striking," says the Rev. Dr. Eric Foley, CEO of Voice of the Martyrs Korea, part of a worldwide fellowship of organizations aiding persecuted Christians worldwide with roots dating back to World War II. "Xi Jinping calls it Sinification—freeing Christianity and other religions from foreign cultural entanglement. Hitler called it Nazification. Both pledged freedom of religion to those who would hang national flags and leader's portraits in their sanctuaries. Both trotted out theologians who insisted the Bible needed to be retranslated to be properly understood. Both accused those who disagreed of seeking to subvert the state." "Think Stalin and Hitler, not Mao," says the Rev. Dr. Bob Fu, founder and director of China Aid, a US-based organization that helps Chinese Christians and reports on human rights and religious freedom developments in China. "China is now taking a page from the 1930s totalitarian playbook. Whereas before the government's goal was to stamp out Christianity, now all efforts are directed at co-opting the moral influence of Christianity and other faiths to advance the Communist Party's social agenda." Foley and Fu see a parallel not only in the actions of the governments but in the response of the faithful Christians of both eras. They are calling on church leaders around the world to offer today's dissident Chinese Christians things their earlier suffering German and Russian counterparts were unable to receive: solidarity and global theological endorsement. "There was no Internet when the German 'Confessing Church' wrote the Barmen Declaration in opposition to Hitler's attempt to redefine Christianity," says Foley. "Today the Barmen Declaration and those who wrote it are revered. But at the time they were cut off from the Body of Christ around the world and forced to suffer while their 'Confessing Church' was crushed." That has Foley and Fu calling on Christian leaders worldwide to add their names to a declaration of religious freedom written by the former law professor and now-jailed Chinese pastor of the Chengdu Early Rain Church, Wang Yi. The document, entitled "A Joint Statement by Pastors: A Declaration for the Sake of the Christian Faith," was originally published in September 2018 with signatures from 439 Chinese pastors. "As the author of this important document, Pastor Wang and Early Rain were also the ones responsible for gathering the signatures of pastors for it," says Fu. "Now that Pastor Wang Yi and the Early Rain leaders are in prison and many pastors who signed the statement are facing similar difficulties, we as Christian leaders worldwide must carry on the good work they began. We must sound a global 'amen' that the Christianity for which they are now suffering is 'the faith which was once for all delivered to the saints.'" Christian churches in China believe unconditionally that the Bible is the Word and Revelation of God. It is the source and final authority of all righteousness, ethics, and salvation. All true churches in China that belong to Christ must hold to the principle of the separation of church and state and must proclaim Christ as the sole head of the church. The full declaration is available at www.chinadeclaration.com, the website created by Voice of the Martyrs Korea and China Aid to enable pastors and church leaders to add their own names to those of the 439 Chinese pastors. Those wishing to sign the declaration should do so, along with their church name, role, and a contact email, by the end of March. Voice of the Martyrs Korea and China Aid will verify each signee and present the 'signed' document to the Chinese Embassy in Seoul. "It's important to note that the declaration written by these Chinese pastors is entitled 'A Declaration for the Sake of the Christian Faith,'" says Foley. "This is about more than China. It is about the Christian faith. An attack on the integrity of the Christian faith anywhere at any time is an attack on the integrity of the Christian faith everywhere at all times." "439 Chinese pastors signed this declaration," says Fu. "We are asking the Lord for each signature to yield a hundredfold harvest, which means we are praying for 43,900 pastors and church leaders around the world brave enough to sign this document in suffering solidarity with the pastors of China." For more information contact VOM Korea's Danielle Mirae Yoo at +82-2-2065-0703 or myoo@vomkorea.com or China Aid's Brynne Lawrence at +1-432-689-6985 or b.lawrence@chinaaid.org.